Friday 23rd September 2016, 7:30 p.m.
"Excellent venue - great atmosphere - excellent music with superb musicians. Absolutely fabulous evening." Ian Shovlin. "Lovely mix - Greg Knowles is a great guest for the group." "Absolutely brilliant! Music is superb. 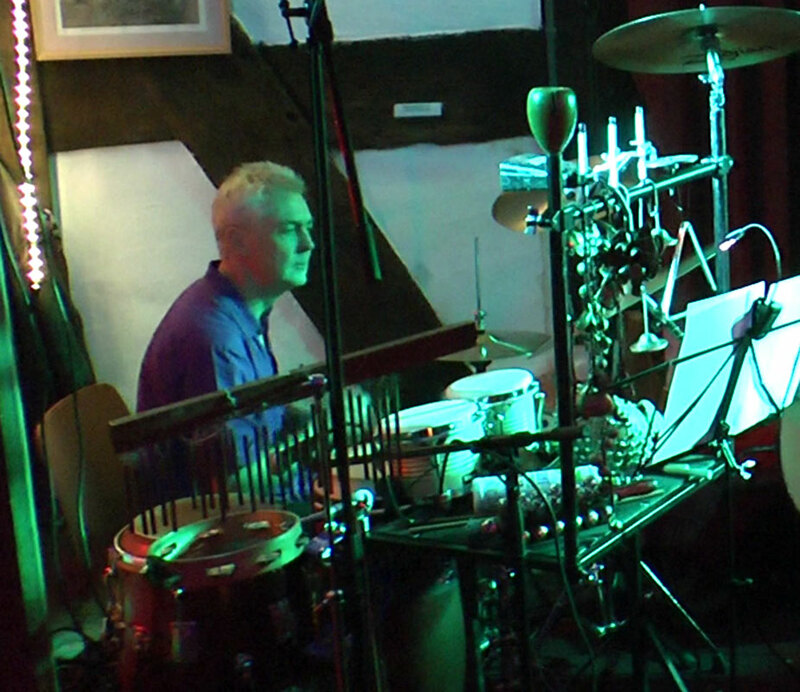 So impressed with James" [Watson, Ed] "& the percussionist" [Greg Knowles] "- beautiful improvisation. Just in awe at the talent in the room - Brill! Brill! Brill! I love the venue, the music and the ambience." Jo Norton. "It just gets better and better! Great vibes with James with the band. Loved his solo numbers too." Val Dawson. "Good stuff! Very polished, pleasing sound. Lively and authoritative playing. Please could the diction of the ladies be as clear as Ken's?" [Ed. I'll have words. Catherine Kinsey's lyrics are the most important part of the songs.] "Sound is very good." "We don't think the two guitarists like each other!" [Ed. Eh? Some people are weird.] "Otherwise a lovely evening." Playing drums at an early age in bands, orchestras and brass bands Greg studied formally at the RNCM with Gilbert Webster. He went from there to London to work with Peter Maxwell Davies. He started working in studios and West End Shows, playing with various artists including Nigel Kennedy, Madonna, Freddy Mercury, Pet Shop Boys, and Echo and the Bunny Men. Greg also worked with Ray Russell and Mo Foster at The Montreux Jazz Festival. He has worked on movie sound tracks for Lord of the Rings, Ravenous with Damon Albarn, Hunger Games with The Punch Brothers, and most recently Hercules for composer Fernando Velasquez. He has been writing library music for 25 years, and provided music for the wedding scene in Harry Potter and the Deathly Hallows. Recent engagements at the Royal Opera House in Winter's Tale for composer Joby Talbot, and now MD in Wolf Hall for the Royal Shakespeare Company. 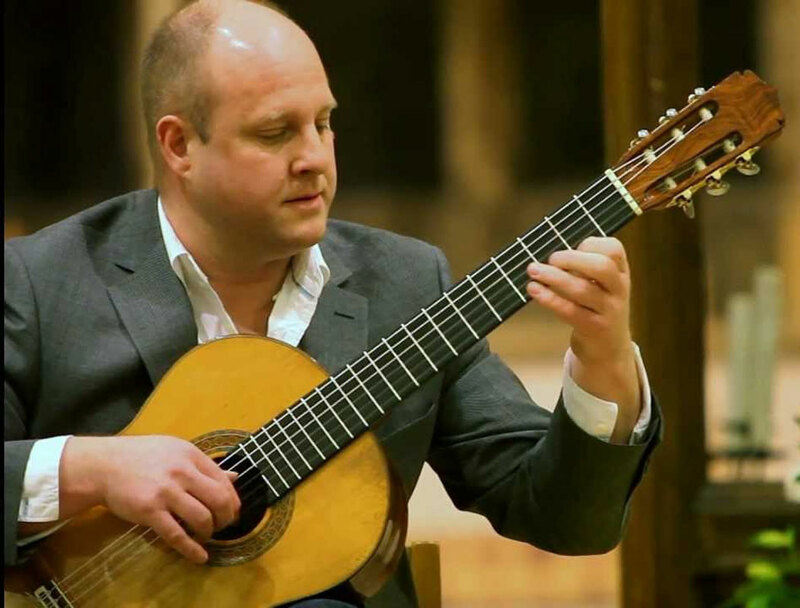 James Watson is a virtuoso classical / jazz guitarist and composer based in Gloucester. He has played many solo concerts and also performed with various outstanding musicians including Raimundo Fernandez (pianist), Cuffy Cuthbertson (Flamenco guitarist) and Patsy Gamble (saxophonist). James has produced 6 CD’s including his Solo Classical debut album ‘Eloquence’ (2007), followed by ‘Sound Pictures’ (2009), ‘In Company’ (2010), ‘Duets’ (2011), ‘Skyline’ (2012) and 'Places In The Sun' (2013).